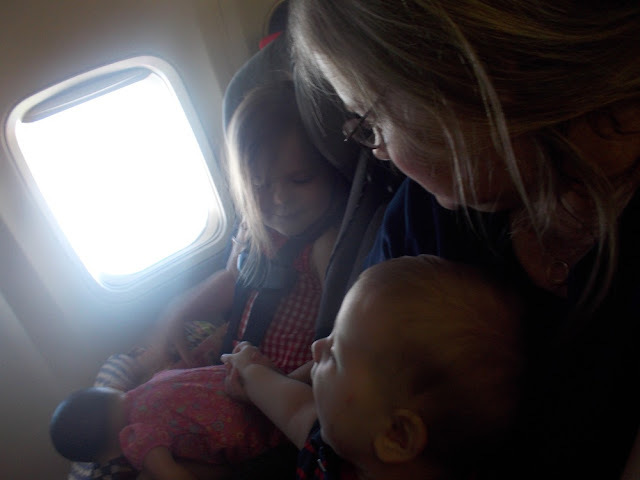 I'm not sure why I had visions of disaster whenever I thought of riding on a plane with my three little bundles of energy. Maybe it was all those early morning national news shows where I've seen frazzled looking parents tell horror stories about planes returning to the gate to kick them to the curb because their child was crying and somehow I could picture that one of my three could be having the worst-day-ever and we'd be booted. Not once did I think, "Hey, these kids drove through at least 25 states this past year. They were with us from Florida to California, California to Michigan, Michigan to Florida (and back), Michigan to Montana (and back) and Michigan to Massachusetts (and back) in the past year... maybe they won't think six hours on a plane is all that bad..."
I mean we've spent fourteen hours a day in the car together without a tear. Don't ask me how. I have no idea. They just seem to like driving. Paul and I like driving, and it seems to have rubbed off on our offspring, who tend to giggle at things they see out the window and make comments like "Mommy, please don't make me ride a buffalo from North Dakota to Montana..." as we drive past bison in fields by the freeway. I wasn't sure how things would go, however, as we navigated and airport and loaded into the crush of people on the plane. I knew Sadie would be fine. But Patrick and Mae? Loose cannons. 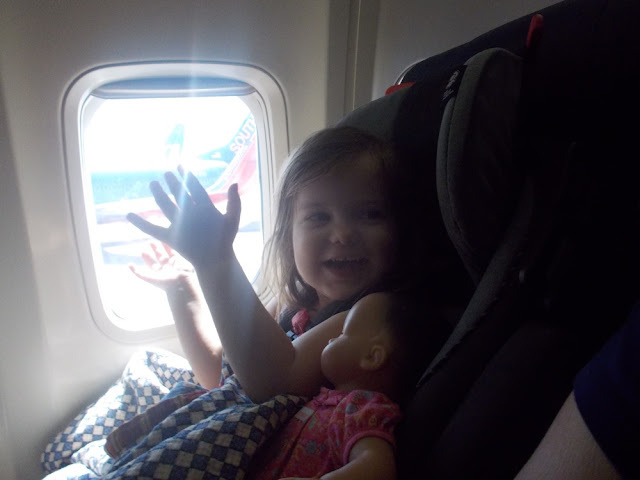 It didn't help when we got to the gate and I had the distinct impression that the crowd had turned against us, merely because we'd showed up with little people in tow. They were quiet at that point and people were already glaring. We got nervous glances as we walked past gates. You could practically hear people mentally chanting "Not our plane! Don't sit down here!" A few people were sympathetic as a stressed out Patrick started to fuss and then passed our before we loaded on the plane, but most seemed ready to suggest we find another mode of travel as unfriendly eyes followed Mae and Patrick's every move and keen ears waited for a sound to confirm their worst fears. At least that's what I imagined when I looked up and saw multiple people glaring in our direction. She snuggled down with her doll. 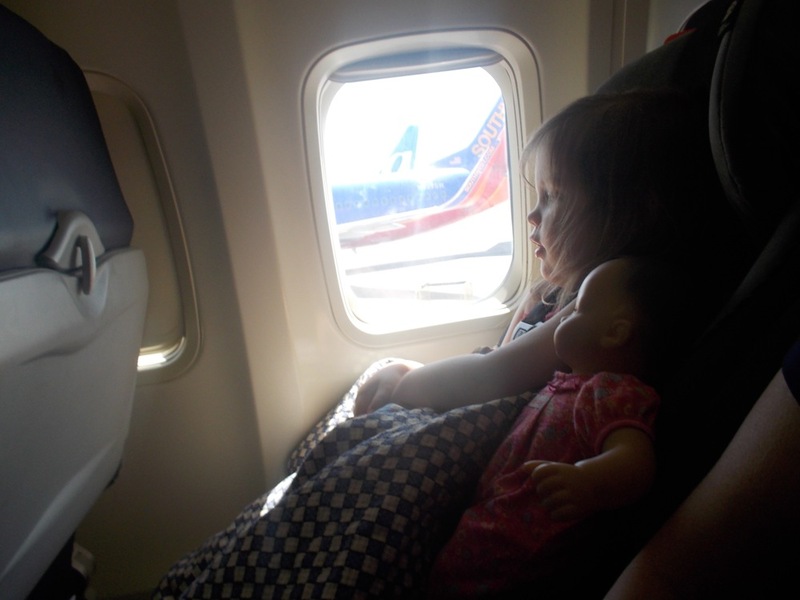 She repeatedly checked to make sure that her doll was covered with the blanket. 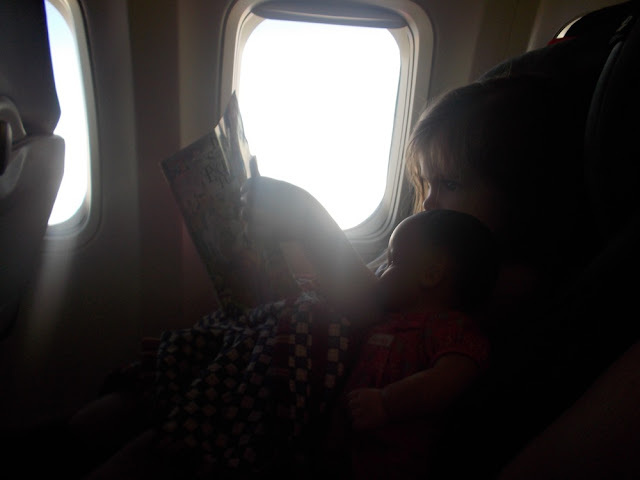 When Nani offered her a hand, just in case she got scared on takeoff, Mae pulled her little hand back and then offered it to her doll, because let's face it, her doll is the real baby. 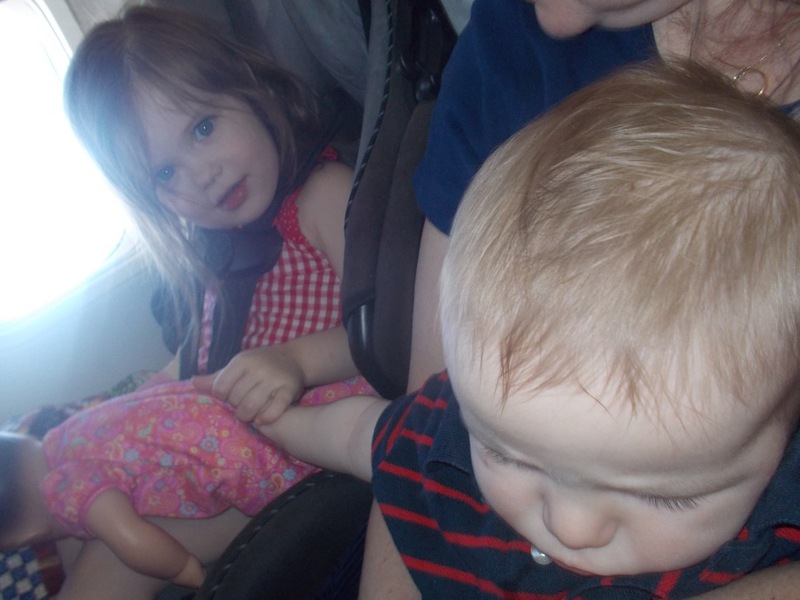 All in all, after over six hours in the air, there was about five minutes of Patrick crying. He tugged at his ears as I tried to convince him to nurse, obviously not thrilled about how the change in altitude was making his ears feel. Now two weeks of relaxation before Paul arrives and we brave taking our trio back through the airports to Michigan. And I have to say... I'm still a little nervous! So glad your trip went smoothly! Thinking about the reactions of other passengers can be as stressful as worrying about how the kids will behave. 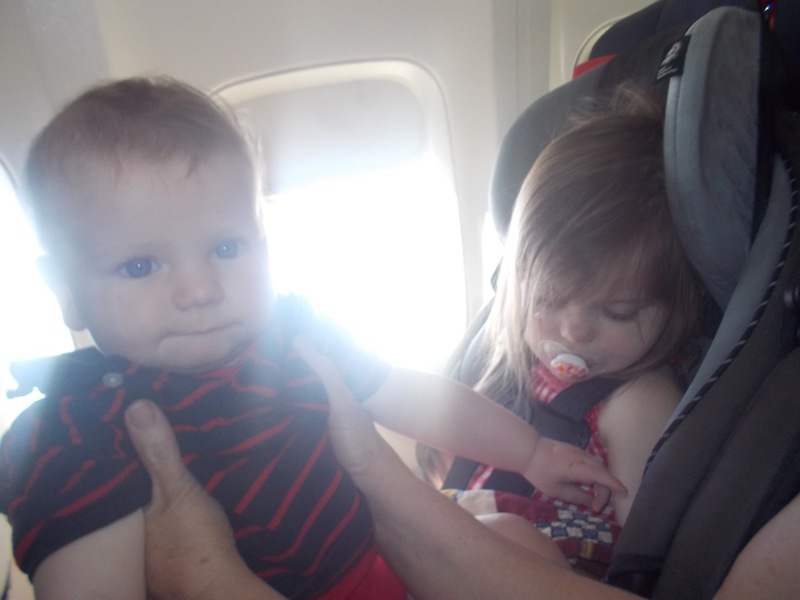 We travelled by plane when our oldest was 18 months and he did fine for the first (10 hour) flight. But the second (3 hour) flight was horrible b/c the 2 grown men in front of us kept talking so loud they kept waking our baby up! So glad it has gone well! Will send prayers for a wonderful holiday and safe trip home! I traveled in April from New Orleans to Boston with both of my daughters, the mellow little 6-month old, Gabe, and the not-quite-two year old wild man, Ben. Ben cannot stand to sit still, and except for when he fell asleep for 45 minutes, his mom was trying to entertain him to prevent bloodcurdling shrieks, of which we experienced several. Gabe was his usual happy little self, nursed frequently, and - aside from a monumental "poop-splosion" while on my lap - was a happy little camper. 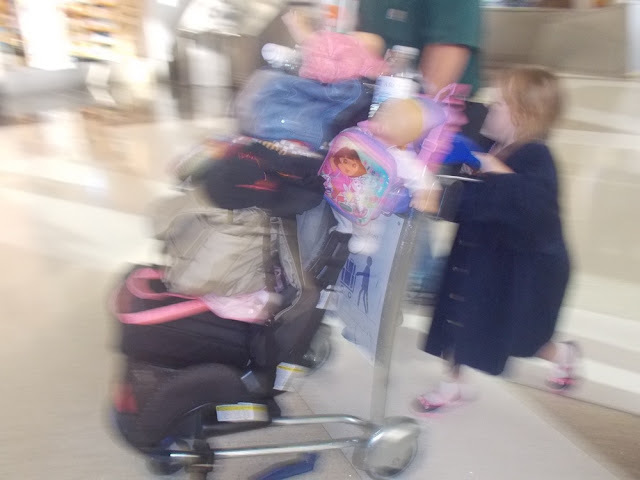 We had so much baby stuff with us (two carseats, strollers, one pack-n-play) that we looked like nomads traveling with all our earthly possessions. Though I love spending time with the little guys anytime and anywhere, I think that I would prefer it to be in a not-so-confined space.